This week, The Skirted Roundtable welcomed Ms. Margaret Russell for an in-depth talk about Elle Decor (of course! ), her latest book "Style and Substance," blogging and copyrights (Joni is in trouble!!) and lots of other topics. Russell is a fascinating woman - she's been with Elle Decor since the beginning - 20 years now - and as Editor-In-Chief is faced with the formidable task of putting out a quality magazine month after month, all while staying on budget in these very trying times. Thank God for Margaret Russell is all we can say! She has made a success out of Elle Decor and judging by how tough the economy is right now - we have only her to thank for the magazine's success. Russell discusses why she thinks Elle Decor has managed to stay alive while so many other magazines have left us. A graduate of Brown, she had plans to be a lawyer, but life changed everything and for that we are grateful. It's extremely hard to even imagine Elle Decor without Margaret Russell. The book: it's wonderful - full of images from the past twenty years. "Style and Substance" was beautifully edited - painstakingly put together from masses of culled pictures - and it shows. It's lush, interesting, and gorgeous! Instead of focusing on photoshoots of individual houses, it is organized around rooms such as libraries, baths, bedrooms, kitchens, etc. Even the kids get their own chapter. Looking over all the pictures, it's amazing how many of them have become classics - shown over and over again on the design blogs to make a point or to explain a particular obsession. All three photographs were cover stories - this one is from Sarah Jessica Parker's summer house. This cover shot is slightly different from the image in the book and Russell explains why. This picture of a vacation house designed by Victoria Hagan was on the cover of the best selling Elle Decor. Why? Russell tries to explain it - but popular covers are elusive. No one is really sure what is going to sell and what isn't. Rumors are this cover was the inspiration for the Something's Gotta Give house. True? We discuss that too! And finally - this picture featuring a gorgeous bedroom by Vicente Wolf almost made the cover of "Style and Substance." Russell tells us why she eventually went with the Hagan cover instead. As usual, Linda had to play the disciplinarian and tell us we had been talking for almost an hour and it was time to wrap it up. Why does it always go by too fast when we have an guest - we could have talked for another hour with Ms. Russell - at least! Charming, beautiful, and highly intelligent - she definitely has it ALL!!!! We are in awe, you will be too. To listen to Margaret Russell talk about her career starting off as an editorial assistant and working with Elle Decor for the last 20 years is something that is very dear and close to my heart. I was asked 18 years ago around the same time as Margaret started as Editor in Chief to be the Decorating Editor for Vogue Living Australia, I was eight months pregnant back then and my fate was unfortunately decided for me by one woman at the magazine who felt that I just couldn't juggle this position and a new baby. It was a very sad day for me and my life-path changed direction. Listening to Margaret talk, I really do wish I did take on the position. I think that the woman who interviewed Margaret was a very smart lady to choose her for this creative position. I can hear Margaret's passion and love for her job in her voice and I totally relate to her in so many ways, I understand her choice to use experts in decorating and I understand her love of transparency film and her concern for photographer's credit when bloggers use their images. Don't worry Joni, the images you and many bloggers use promote the American magazines that we Aussie's don't often see and I can understand that it does offend the photographers but it is spreading a very positive message about the magazine. I have subscribed to many U.S. magazines since I have been a blogger and I have never subscribed to mags before. Congratulations, I do love listening to your interviews and this one is fabulous, thank you Megan, Joni and Linda for sharing this with us. I'm so sorry this message is so long, but your interview just makes me want to express my thoughts and it totally inspires me to do so much more with my day and my work. Amazing interview, so human and refreshing...this will be a book on my christmas list for sure! Outstanding - it's so fascinating to hear the behind-the-scenes decisions for the book and the magazine. Great info too re: photo credits and copyright. A huge thank you to the three of you for bringing us these great interviews and features every week. Great interviews with Ms. Russell and Ms. Kasler! I love what you ladies are doing with this website. It's entertaining and informative, and I look forward to every discussion. This is a website I'd be happy to see getting paid advertising...you guys deserve compensation! Excellent interview as always ladies! Fascinating to listen to the talk about why the cover was so popular. Great interview! I'm a huge fan of M Russel, and she really is sharp as a knife. Would love for you guys to do more interiviews like these, and also discuss current issues of magazines and spreads (like when you discussed the What makes a room great a while back). Great interview. I especially liked how MR emphasized that she also ran a business, and therefore has not yet had to cut costs, because she always kept expenses under control. It makes me wonder if Southern Accents was not operating profitably, if it was not operating profitably enough, or simply didn't fit into Time's core business model. Although I wish they sold that asset instead of disbanding it. Very strange that I came to this page to see that Maria Killam has already left a comment, because I want to put in a request that you have her on the Skirted Roundtable! I believe Joni once expressed a similar opinion? Thanks so much. Professionalism, business savvy, hard work, and people skills are what gets the talent out there. True in all professions. Wonderful interview! I can't wait to get my hands on this book. I have ot be honest that at first I was nervous for you all because she's such a presence but of course you 3 handled it perfectly like usual. Off to listen to all my missed episodes- it's finally working for me!! What a treat to hear from someone in a leadership position give so much credit to her staff. She could easily have tossed that dark hair and said, "Yes, I am fabulous." I love to see someone shift the spotlight. Goodness ladies, you've done it again! Very insightful, great to hear what Ms Russell has to say, Elle Decor is one of a kind. I heart The Skirted Roundtable, what a blessing you are to your fellow designers. Sooooo excited to see you will be speaking with Alessandra Blanca, her work is stunning. that was SUCH a great interview! I really enjoyed her style and intelligence. 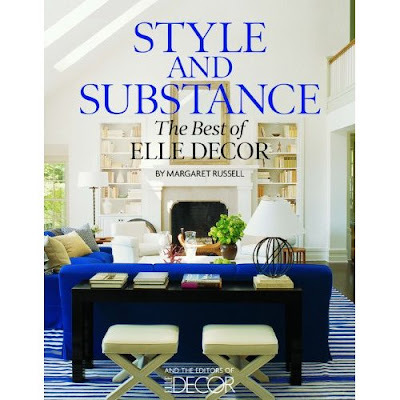 Her buisness acumen seems bar none...She has undoubtedly been the force and verve behind Elle Decor! I agree with the above poster...how refreshing and honest she is at crediting her staff and her photographers while protecting them. She is such smart, realistic woman, I like her no nonsense aproach, she is clear about her preferences, things dear to her and I feel how her life has been wrapped around her profession. Love how she sticks out for the photographers and her staff. She sounds refreshing and all fits so together with Elle Decor! Ms. Russell is so charming and I adore her visions! I am a huge fan of Elle Decor! It's obvious that we need to listen to others and gain insight from so many places so we grow as designers. Thank goodness the learning never stops and possibilities come as a result of stretching our focus. Many new influences especially using technology of today like these podcasts keep us on top of great things! Thanks for being that vehicle and bringing us great individuals to learn from. This interview was so inspiring. Margaret Russell -- a woman of today, with true humility, creativity and passion. Thanks so much. The last two interviews have been amazing. Both such generous, talented, intelligent, amazing women. You three must be ecstatic over how the SRT has taken off. Never stop doing this-I love it!!!! Just goes to show the enduring popularity of blue and white! Great interview! I always learn so much from the interviews. So appreciate Ms. Russell taking the time to share about Elle Decor...what a facinating journey! It was a pleasure to listen to this podcast this afternoon, while I enjoyed my pile Elle Decor Magazines! (I'm not lying!) I must buy the book immediately! Margaret is so complimentary of others and so giving. She gives her 'all' to her profession, career, those in need - those who aspire to be like her - she adds such encouragement to everything she touches. Margaret, Thank You. I love how you put 'we bloggers' in our place ever so gently - without offending us or hurting our feelings or hurling lawsuits - I do believe that most bloggers from time to time have used photographs without credit and we all need to work on that. I am however annoyed by the fact that the same magazines give editorial coverage and recognition to those same bloggers who 'steal' from mags. Anyone can become a top blogger simply by copying and pasting images. (even a damn monkey and that's not fair!) It takes a real talent to add editorial content value and a point of view to the world. Those are the bloggers who need to be applauded. (and those bloggers who attempt and often times succeed to take their own photographs for their posts.) I also agree with you 'The SRT Ladies' are incredible 'Editors' in their own right. Kind Regards, Liberty Post Editor, Canada. I can't get over how wonderful this interview and your others are! Since none of you are professional journalists, you ask just the questions that we (your listeners) would and illicit such real answers-- very off the cuff and genuine rather than something super polished. As a result, your guests are so humanized. I was completely charmed by Margaret Russell on the Skirted Roundtable. Thank you so much for doing these interviews! Thanks AnneHH - very well put - we aren't professional journalists!!! well, Linda might be. But I am not for sure. Megan? hmmm. no, I don't think she is either. Thanks for your support - I LOVED your comment. I have never been a fan of elle, I don't like the sjp dining room at all, nor am I fan of the blue and white living room. That being said, I do think Ms. Russell is doing something right because with so many folding, she is still going strong. I loved the interview. Thanks so much for the great interview! I have always loved Margaret Russell, and I particularly enjoyed her comments about bloggers using magazine editorials without giving credits. I encourage you take this seriously, as it is your responsibility as a blogger to make sure you give proper credits. It is really the right thing to do when you consider the work and expense they incur producing the shoots. working my way through the archives, ladies ... another fascinating peek into the mind of a magazine editor (and much more flattering than her reality TV image) ... love how you flat out asked her about reproducing photographs--that's something I've wondered about ... her response was quite a surprise. I'm working my way thru your podcasts and have to say that because of this particular podcast, I ordered Style & Substance. 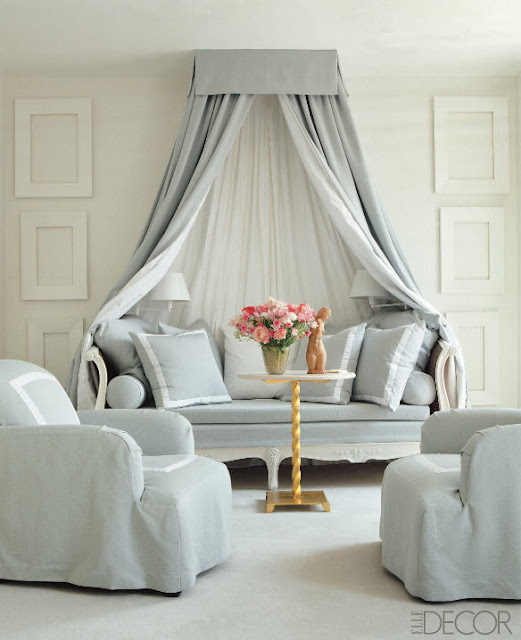 Although my design style is more traditional, I am always looking for inspiration in all realms of the decor world. This roundtable convinced me that I need this book! You know, I have a sort of (stupid) running joke on my blog about Margaret Russell when the reality is that I admire her very much. I have been buying and reading Elle Decor (almost) every single month since the beginning. I love her support of the arts and it's interesting that my daughter is in art school for photography and I'm not giving credit to photographers! I am glad she pointed that out. Although sometimes sourcing a photo is difficult as was pointed out. I have loved and still love Ann Duong's loft and bathroom. It's been in my files forever. MR is very smart in that she understands that things are not going back to the way they were at the height for a very long time, if ever. I think Elle Decor will be just fine with her in charge. The book is a simply stunning collection! As an interior design student I find it truly inspirational and I just ordered myself a copy! It is most definitely a must have!